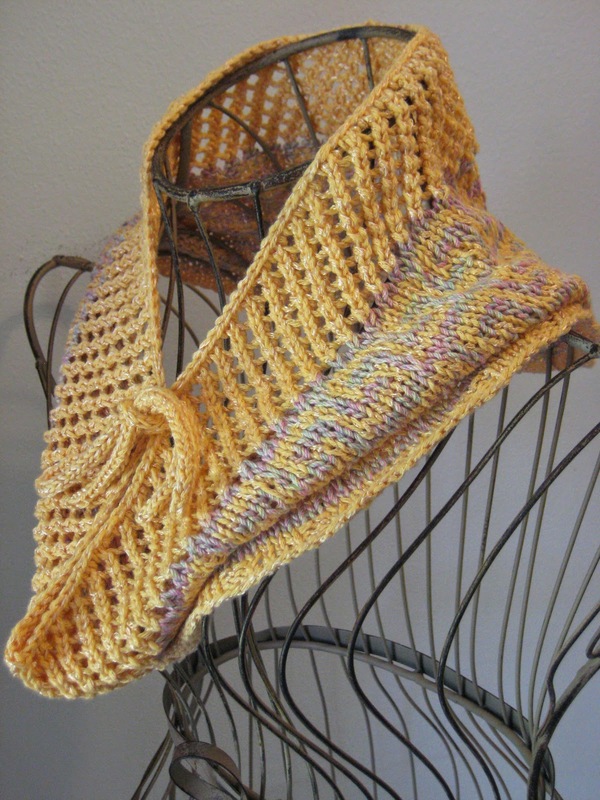 The explanation for this cowl is simple: I love these two yarns together, even if my husband originally thought the combination was strange. And while this piece turned out more like the Sweet Strawberry Cowl and the Sugar & Ice Cowl than I originally intended, it has enough differences to set it apart. 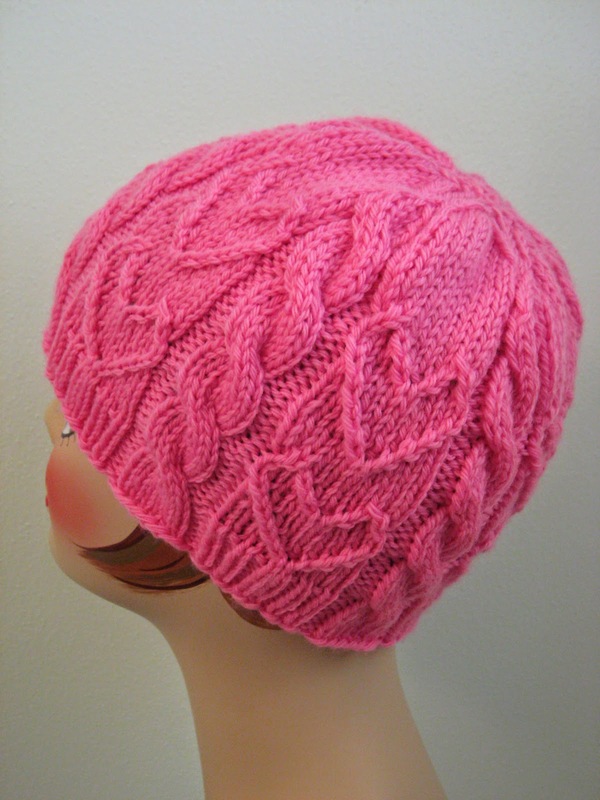 Like the slip stitch pattern, for instance, which would also look good in more contrasting yarns. 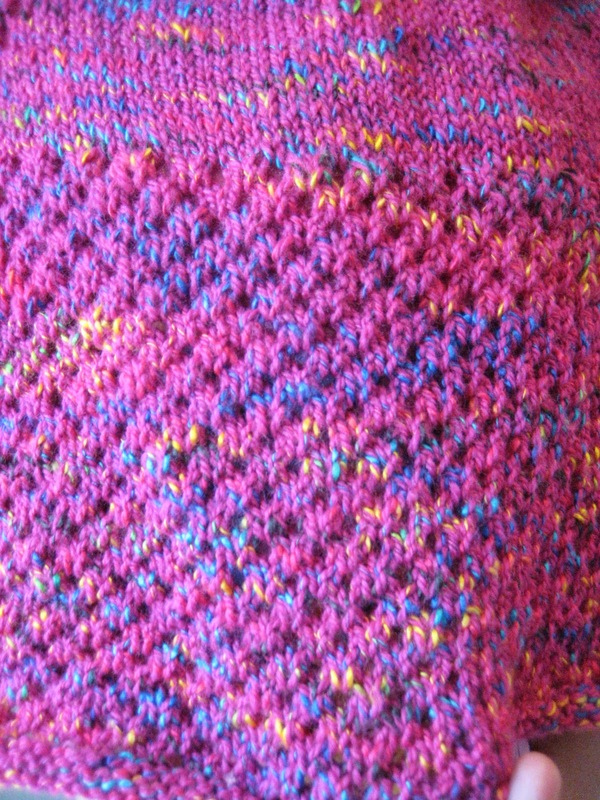 The slip stitch pattern, closer up. When it comes to making hats, I like to live dangerously. 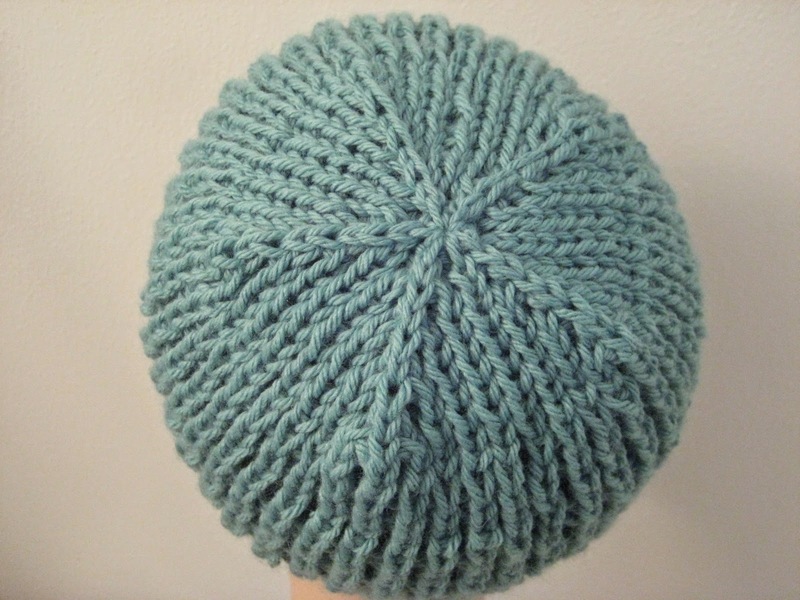 And what I mean by that, naturally, is that I like to use as much of my skein as humanly possible, like in this instance, where I knit the adult size of this hat and had about one yard of yarn left at the end. 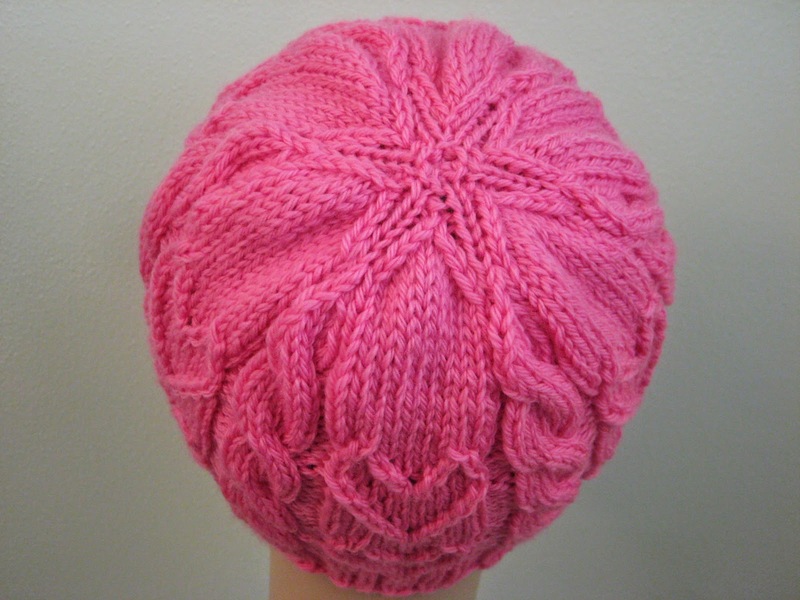 Of course, I mention this to give you a warning; while I knit this hat out of approximately 135 yards of this particular yarn, you may need more. On the plus side, if you knit both sizes, two skeins will definitely be plenty for both! Oh, how I love this yarn. Straight-up cotton (which, despite its difficulties, I adore), and a white base with a neon green spray paint effect, this is the type of fiber that I obsess over and that my husband makes a bit of a squicky face when I purchase. 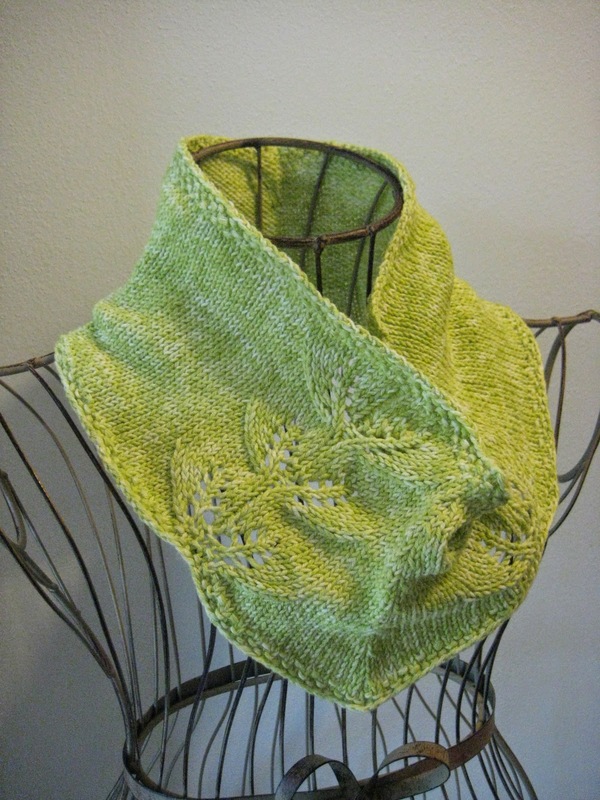 But not even he can argue with the dainty loveliness of this light, one-skein cowl and its basic but delightful pattern. Yay spring! Hey, I'm a poet and I don't... yeah, never mind. 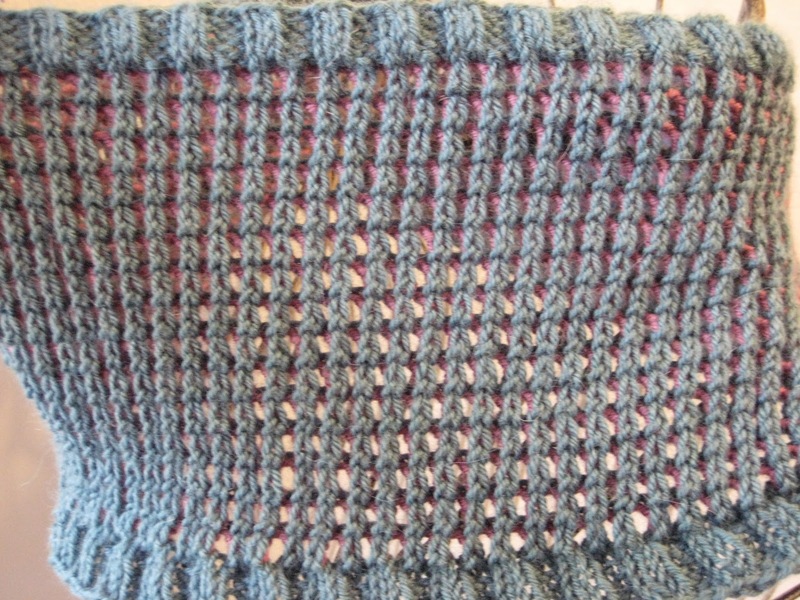 When I first bought this yarn, I had no clue how I was going to use it (well, I knew I would use the two shades together - I love this color palette). 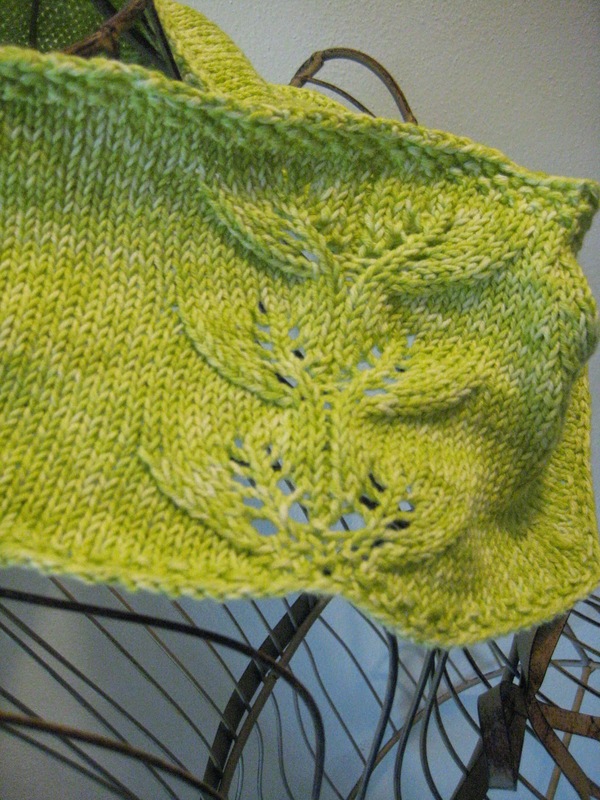 And then I made the Slip-Stitch Mesh Fingerless Gloves and matching hat and the Water Lilies Cowl, and I saw a nice opportunity to combine variations on the slip stitch patterns I used for those pieces to maximum effect. 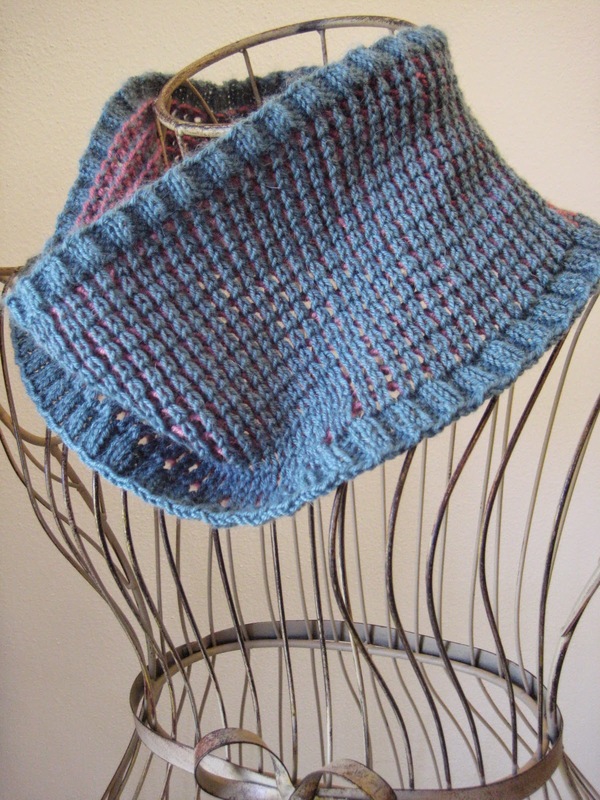 Long story short, while the pictures don't quite do the front slip stitch pattern justice, color-wise (the pink shows up behind the teal a bit more in person than it does in the photos), the combination of the two is quite striking in this closer-fitting cowl. My attempted close-up of the mirage-like color pattern. 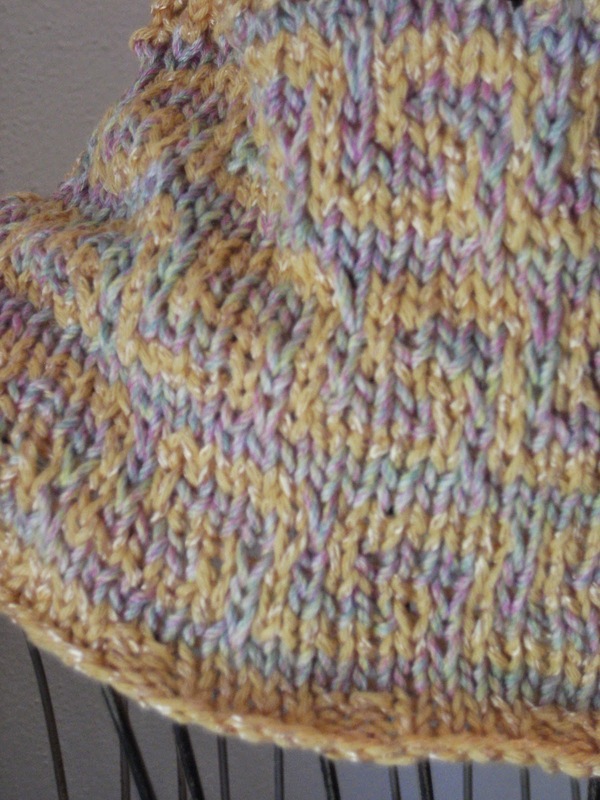 After I finished the Slip-Stitch Mesh Fingerless Gloves, I figured I had just enough yarn left in my skein for a hat. 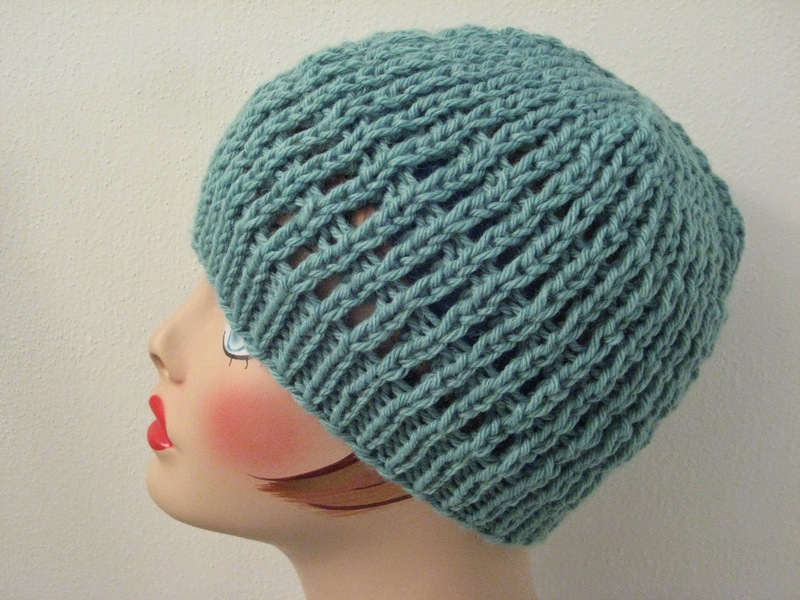 And it seemed like a good idea to make a hat that matched the gloves, since they're knit from the same stuff and all. So, if you're interested in knitting the smaller size of the gloves and the hat as written (I give a variation to make it slightly larger below, and I'm not sure you have enough yarn to accomplish it if you're making the gloves too), you can probably do it with just one ball. 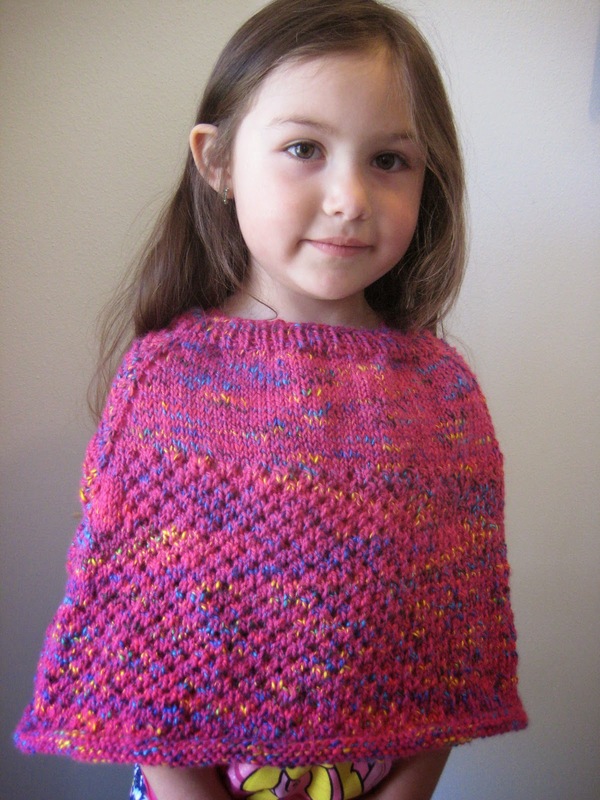 Otherwise, of course, they're both good stash projects that don't use too much yardage! The back. Simple and clean.